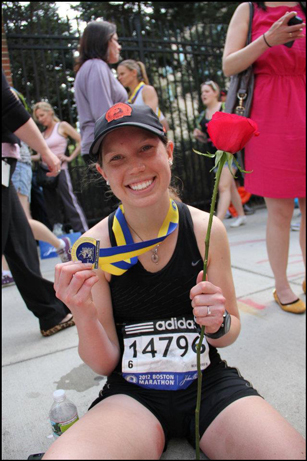 Here is a race report from Boston Marathon 2012. It's a bit late, considering it's 2013, but the blog didn't exist back then! My prayers go out to all of the victims and their families in the 2013 Boston Marathon tragedy. Any struggles that happened in the heat last year are trivial compared to this year's horrible experience. With my mom waiting for me at the finish line last year, I can't even imagine having something like the occurrence this year happen. Weather: Hot, hot, hot! It was a hot and humid 87°F. I had NO clue they had April weather like that in Boston! Race summary: I trained for the Boston hills, but definitely didn't train for heat and humidity. Overall, the race was an awesome experience - tons of people and things to look at, though I did need to change my race strategy due to the heat. I was glad to make it under 03:45 (barely!). Before the race, my mom and I toured Boston and had a great mother-daughter trip before Leo and I got married about a month later. The touring was amazing and so was the Boston food! 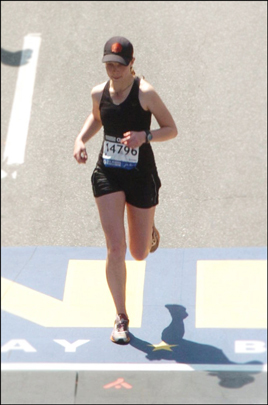 The Boston Marathon was definitely a challenge; not so much the hills, but definitely the heat! I ran through sprinklers, sprays, put ice cubes in my hat, dumped water on my head; anything to keep my body temperature down.The spectators and volunteers were amazing. Cute kids handed out water and ice as we ran by certain areas of the course. Overall, the worst "battle scar" I had from the race was majorchafing on the inside of my legs. Lovely, I know! I always Vaseline my legs to prevent incidences like this, but it was washed off by the countless sprinklers and water I dumped on myself. I didn't realize how bad it was until after the race and all of the endorphins and adrenaline slowed a bit. I ended up with a frisbee-sized area of raw skin, which didn't feel too glorious in the shower. Oh well, 'tis a mere flesh wound! God carried me through the entire race and kept me from passing out, especially in the final stretch to the finish line. I saw many people in the med-tents and heard some passed out from the heat. My heart rate was so much higher than in training due to the heat, my main focus was to finish the race. Pace wasn't too important anymore, if I didn't finish, no medal! For the final stretch of the race, I somehow had energy left for one last kick (and thank God I didn't fall on my face in front of all those people!). Mom gave me a flower at the finish! I was really happy with my finish time, though it was slower than my goal of 03:30. No one could predict heat like that in Boston! Only God knows. After the race, it took a week or so for my heart rate and body to mellow out. Clearly this Scandinavian girl wasn't meant for heat and humidity! It felt great to return to Minnesota afterwards and this was definitely a once in a lifetime race; mainly because it's too spendy to run every year. My mom and I celebrated our Boston journey with a nice supper; Coffee and clam chowder with Boston cream pie for dessert. Don't worry, I drank plenty of water to offset the coffee and dehydration! Coffee is always good. I was reading Ryan Hall's book, "Running with Joy", on the way to and from Boston. He's a really solid man of God, an a kickin' marathoner! Sometimes the worries of this world make it hard to keep your focus on God, but nothing is more freeing than keeping an eternal perspective focused on God and His Kingdom! I'm starting to feel like myself now after having our little man in March. Running is SO much easier without a big belly and squished bladder! Having a baby at home has given life a new perspective for me, too. Running, and life in general, is full of more joy knowing we are blessed with such a sweet little son! Also, I'm going to apply the below running tip to my life! F - 3.77 mile jogging stroller run with Leo and E in SHORTS! Summer has arrived! Just for a little running background... I've loved running since I ran my first 5k in 2009 (prior to that, I thought only crazy people ran longer than 1 mile!). It was a great way to chill out before my senior portfolio presentation in college and a great solo or group activity once I moved to a new town for work. Five marathons later, it's still my favorite activity! Running kept me a bit more sane during my pregnancy with Eli and has proven to be great "mommy alone time" now that our little man is here. The peace and quiet outside in the morning is great for spending time with God in His Creation, praying, and reflecting. Running when pregnant was great, but proved to be a bit lonely. I didn't know any pregnant running moms in our area, so I researched what other pregnant moms that DO run experienced during their pregnancies. 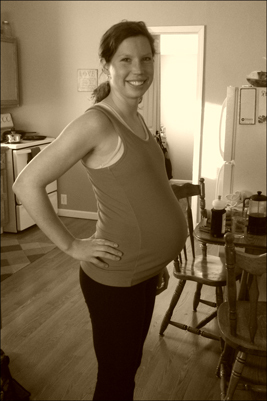 Being an active pregnant momma brought on more criticism that I ever expected. Looking back now, though, none of it matters! Here I am, writing, while my healthy, beautiful little guy is taking a nap :) I'm so in love and I wouldn't change a thing about him. 5 Days Before Eli's Arrival! Speedy Postpartum Recovery: The labor and delivery went very quickly and without a hitch. From the time early labor started to when he popped out, I think it was about 13 hours. Fast, compared to what I'd been told it would be like! I felt pretty good after delivering and was able to walk around afterwards. It helped immensely to recover fast so I could take care of the little guy when we went home two days later. I was able to be up and running again at 3 weeks, which was another perk. Healthy Weight Gain: I gained 20 lbs. when pregnant with Eli and my weight returned to normal fairly quick. This helped with being active during and after pregnancy; excessive weight gain definitely stresses the already stressed out joints. I did put on most of the weight early in the pregnancy, which scared me a bit. I had run Boston Marathon two months prior and was training again at that time, so I think my body went into "fat storage mode" to prep for growing a baby! Less Fatigue & Pains: Staying active helped me get through the nausea and fatigue early on in pregnancy. Keeping a strong core also helped to prevent back pains later in pregnancy. My back would still get sore, but it was definitely nothing to complain about! Preterm labor Symptoms: For future pregnancies, I am going to be watching carfully for preterm labor symptoms! A urinary tract infection combined with dehydration caused preterm labor to start up at 33.5 weeks. After being stuffed with fluids and put on a magnesium sulfate drip, everything calmed down and we were sent home. E was born at 35 weeks - our little healthy man! It really shocked me that I felt no symptoms with the UTI. Even more bathroom trips and fluids next time, I guess! Jogging Stroller Training: Jogging strollers are awesome because you can enjoy a run WITH your little one, but WOW they are work! Running with one arm swinging and one arm pushing is a skill I have yet to master. Plus side? It makes running without a stroller seem really easy. I guess Eli will be riding with on training runs when he's a bit older! Why stay active when you are pregnant? Have shorter and less complicated labors and less need for medical intervention. Have more energy during their pregnancies and recover faster after delivery. Return to their pre-pregnancy weight sooner than less active women. Gain less weight during pregnancy. Experience an improved body image, enhanced self-esteem and a general sense of well-being. Experience a decrease in the common discomforts of pregnancy. Experience fewer colds and other respiratory viruses. Less fat. Babies born to exercising mothers had less overall body fat but were no more likely to be born at “low birth weight” and were fully developed compared to their counterparts born to non-exercising moms. More adaptive to their external surroundings. These babies tend to be alert and less startled by their environment, and able to settle and soothe themselves requiring less comforting. Normal in growth and development. Clapp tested children in his studies at one year and again at five years and found no stunting of growth or development. Source: *Clapp III, James F. Exercising Through your Pregnancy. Champaign, IL: Human Kinetics, 1998. *Disclaimer* Get approval from your doctor before you start exercising. I am NOT a doctor! The weather is finally starting to warm up here! 60 degrees is in the weekend forecast. Time to break out the shorts! I went for a 5 mile run before the boys were up. The run felt really good, I ran some of the park hills that are still a bit snowy, and the sunrise was gorgeous. When I got back home, we all had sausage, gravy, and biscuits for breakfast. Leo headed to a meeting and Eli and I had our devotional time together. I read the Bible to him every day because Leo and I really want to impress God's Word on his heart at an early age (Deuteronomy 6:5-9). I enjoy reading to him and I know he hears me! This morning I was studying Romans 4 and came across the story of Abraham and his righteousness. This is such a good Biblical example of unwavering faith in God no matter the circumstances! Even though it seemed impossible for him and Sarah to have children, Abraham didn't lose faith! He stood firm in his faith and God credited this to him as righteousness. Each day I want to stand firm in my faith like Abraham. God promises to provide for our needs and I need to remind myself of that and BELIEVE that each day! I have a tendency to live out a "try harder" faith and I'm praying for God to work in my heart and remind me that it's my faith in Him that matters, not my works. My name is Amy and I live in the northern tundra with my amazing husband and son. I’m a passionate follower of Jesus Christ, wife, mother, graphic designer, runner, and outdoor enthusiast. My husband and I were married in spring 2012 and our son was born March 2013. Both my husband and son are such amazing blessings in my life! I love being a wife and mother. On a daily basis, I love to get out for a run, make breakfast for my husband (I'm an extreme morning person! ), read the Bible and spend time with God in the morning, and take care of our little guy. Being first-time parents has definitely been a learning experience for both of us, but we are doing our best to find joy in each day God has blessed us with. Even in trials each day of life is such a blessing. My life verse is: 1 Corinthians 10:31 - Whether you eat or drink or whatever you do; do it all for the glory of God. Whether I'm cleaning the house, running a marathon, or spending time with family and friends, I want to dedicate everything I do to the glory of God. Every good thing comes from Him! This blog will contain posts about life in general from my point of view with topics ranging from faith, new motherhood and marriage, to marathoning and training. The name “Life to the Full” comes from the Bible verse John 10:10 where Jesus tells us that He will give us life, life to the full. We were not created to just “survive” this life. God wants us to live passionately and thrive for His glory! I hope that this blog will encourage and inspire or at least entertain you!